Part II took me a lot longer to read than the reading schedule I had laid out for myself in June. I got bogged down reading the epilogue and life just kept getting in the way! And after all this reading, I think I FINALLY have a better understanding of what is meant by practice. (If I take away nothing more than this, it will have been worth reading this book!) It was the epilogue on design that made this clear. Practice is a response to institutional design, not a just a result of. It is emergent. Lived. Responsive. Negotiated. So you can’t just ask people about the structure of an institution and take it as a crystallization or proxy for what people do. “Communities of practice are about content – about learning as a living experience of negotiating meaning – not about form. In this sense, they cannot be legislated into existence or defined by decree. They can be recognized, supported, encouraged, and nurtured, but they are not reified, designable units. Practice itself is not amenable to design.” (p.229) There’s a little part of me still wondering why you can’t design systems that support and encourage a community of practice with particular qualities or learning, but I think the point is that practice is separate from, though inextricably, dualistically linked with, any kind of reification. Practice is about meaning, community, and learning. It is between and across and within. This is a social theory of learning, after all. Quick note on my own process: I continue to like being about to use an old fashioned pencil to highlight important sections in my book, and I found that as I went back to type out important quotes, it was also a way to review my understanding. Again, I debated whether to include all my quotes below, but I like being able to search through them, so there you have it. p.155 “Outbound trajectories. Some trajectories lead out of the a community, as when children grow up. What matters then is how a form of participation enables what comes next.” – Connection with school research: Schools as prepping kids for their future. – this seems true of my experience in schools – I was always thinking about or looking for the next step while other teachers saw their trajectory as staying in the classroom. p.177 “Through engagement, participants do not necessarily understand the world, each other’s experience, or their shared enterprise more accurately. Mutual engagement merely creates a shared reality in which to act and construct an identity.” – This seems to be a mechanism for how creating or problem solving together creates relationships (common identities?) between people. p.182-183 “Though engagement, imagination, and alignment are distinct modes of belonging, they are not mutually exclusive. A given community can be constituted by all three in various proportions, and the variety of these combinations results in communities with distinct qualities. Given a community, one might wonder what the possibilities for mutual engagement are, what material supports imagination, and how alignment is secured. Such questions focus not on classification but on mechanisms of community formation, as well as on the trade-offs and kinds of work involved.” – These are the structures that you might study of a program. p.195 “Note that even when this kind of identification is instantaneous, it still involves the work of imagination – again not in the sense that it is less real than identification based on mutual engagement, but that it brings about relations of identification established through a picture of the world into which the self can be projected.” – This addressed my misconception of imagination as not real. p.196 “Similarly, ‘going along’ – through willing allegiance or mere submission – is a form of identification because it shapes the way we experience our own power and thus contributes to defining our identity.” – This was absolutely my experience at my first Wisconsin hockey game – when a particular song came on (I think it was Roll Out the Barrel), everyone stood up and started doing a series of dance motions along with the music. I had no idea what they were doing and lamely tried to follow, but I was completely caught off guard. “All this alignment of engirt creates a way of taking part in something big” (p.196) Again, this explains a mechanism for how we get swept up into something like rooting for college athletics. p.196 “They begrudge the strictures and status of their positions, but they mostly subscribe to the political system that plays them there. Their interpretations of their working conditions are indeed complex and somewhat contradictory.” – Explains how we experience contradictory feelings or observe what seems like contradictory actions but actually make sense. 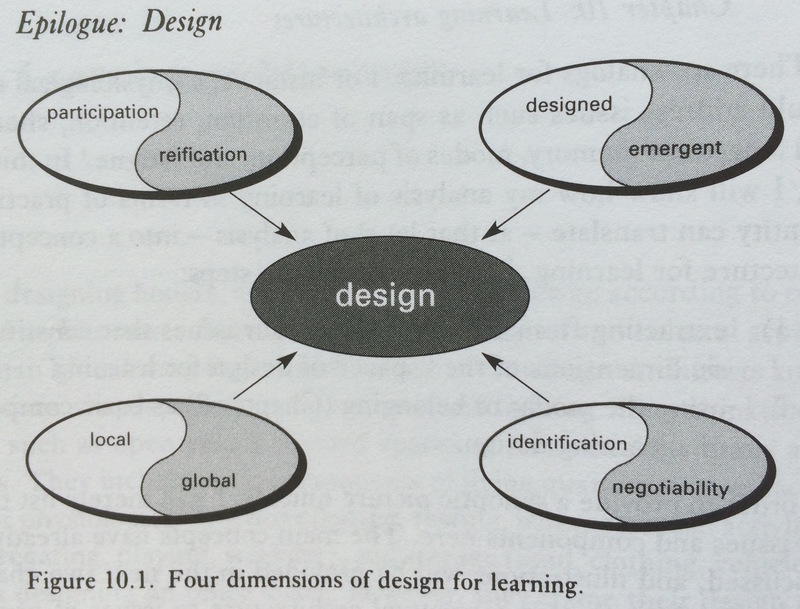 p.203 “I argued in Coda I that learning requires an interplay of experience and competence. A split between production and adoption of meaning thus compromises learning because it presents it as a choice between experience and competence: you must choose between your own experience as a resource for the production of meaning and your membership in a community where your compete is determined by your adoption of other’s proposals for meaning. In other words, learning depends on our ability to contribute to the collective production of meaning because it is by this process that experience and competence pull each other.” – I think this is important but I don’t really understand it. p.203 “When, in a community of practice, the distinction between the production and adoption of meaning reflects enduring patterns of engagement among members – that is, when some always produce and some always adopt – the local economy of meaning yields very uneven ownership of meaning. This situation, when it persists, results in a mutually reinforcing condition of both marginality and inability to learn.” – Like the achievement gap? therefore if you don’t get at people’s PRACTICE and just ask them about the institutions, you never get at their responses or lived experience. No window into how people negotiate meaning or identity. p.255 CoP “do create distinct histories, which give rise to boundaries and can thus be a source of fragmentation. In an organization, the challenge of engagement requires a balancing act between depth and fragmentation.” reminds me of divisional identities and isolations – which from this perspective may be a natural part of the ebb and flow of creation and establishment of CoP and then boundary areas that allow for innovation which then become the CoP and create new histories and their own boundaries. p.264 “there is a pedagogical cost to reifying in that it requires additional work – even, possibly, a new practice – to make sense of the reification” – just making sense of the way math, for example, is communicated can become its own practice, rather than just being a way to communicate concepts and build skills. p.265 “To the extent that knowledge is reified, decontextualized, or proceduralized, learning can lead to a literal dependence on the reification of the subject matter, and thus (as I argued in Chapter 9) to a brittle kind of understanding with very narrow applicability.” ex. math applied in science class. Kids looked at me like they had never heard of how to convert kilometers to meters when I know they had been doing it since at least 4th grade! p.265 “The primary focus must be on the negotiation of meaning rather than on the mechanics of information transmission and acquisition.” Though maybe sometimes the mechanics might help you negotiate? Memorization of formula might help you eventually negotiate their meaning? p.267 “if school practices become self-contained then they cease to point anywhere beyond themselves. School learning is just learning school” – I have noted in a few of the PL schools that there is a refrain of preparing kids for their future, essentially supporting a trajectory that will take them out of the community/school. p.269 PL as strengthening student’s identity? we’ve heard a lot of students talk about their community – is this because they actually interact more or is it because they know themselves more? p. 272-3 “Students must be enabled to explore who they are, who they are not, who they could be” through orientation, reflection, and exploration. p.277 “Indeed, the mutuality of engagement is a mutuality of learning.” Again, this is what we see in PL where students and teachers engage in learning together.